The aim of this chapter is to introduce the overall topic of investigation. After reviewing the literature on health system classification, the chapter provides conceptual and operational definitions of decentralization, defines change in health system decentralization, and therefore clarifies what recentralization entails. Instead of considering decentralization as the transfer of a unique block of authority and responsibility, the concept is articulated into three different dimensions: politico-legislative, administrative, and fiscal. Moreover, the chapter describes decentralization and recentralization strategies in several European health systems, and introduces key analytical concepts for the understanding of institutional continuity and change. Finally, an overview of the book is presented. Parts of this chapter, as well as of Chapters 2, 3, and 5, have been published in Social Policy & Administration (2018), 1–15. http://doi.wiley.com/10.1111/spol.12458. DICE Database. 2010. “Health Systems: General Description and Level of Centralization of Health Systems.” ifo Institute, Munich. Available at http://www.cesifo-group.de/DICE/fb/3qAgL9BXh. DICE Database. 2011. “Health Systems: General Description and Level of Centralization of Health Systems.” ifo Institute, Munich. Available at http://www.cesifo-group.de/DICE/fb/3qAgL9BXh. Terlizzi, Andrea. 2018. 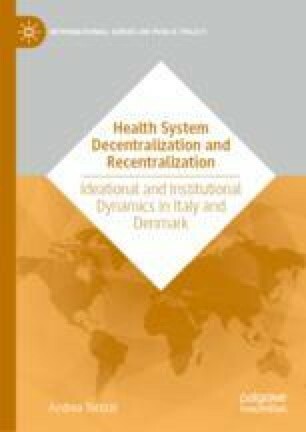 “Health System Decentralization and Recentralization in Italy: Ideas, Discourse, and Institutions.” Social Policy & Administration: 1–15. http://doi.wiley.com/10.1111/spol.12458.